Of the areas listed by USDA GRIN, the following match California: Italy, France, Spain, Croatia, the Azores. The Jepson Manual does not list it as naturalized in California (it doesn't list this species at all) and there are only two points in Calflora, from 1969 and 1995, so it does not appear to be naturalized here. This species was placed on the Cal-IPC watchlist based on our article (Brusati et al 2014) finding it to be invasive in other Mediterranean regions and naturalized in California but the naturalization may have been an exaggeration. Invasive in Romania. Included in study on the phenotype plasticity and functional traits in invasive plants there. One of the five most widespread species invading river floodplains in Central Europe. Listed as a major invader in Mediterranean France, defined as being widespread and having a significant ecological impact. Ruprecht, E., Fenesi A., & Nijs I. (2014). Are plasticity in functional traits and constancy in performance traits linked with invasiveness? An experimental test comparing invasive and naturalized plant species. Biological Invasions. 16, 1359–1372. Podroužková, Š., Janovský Z., Horáčková J., & Juřičková L. (2015). Do snails eat exotic plant species invading river floodplains?. Journal of Molluscan Studies. 81, 139–146. Brunel, S., & Tison J-M. (2005). A method of selection and hierarchisation and the invasive and potentially invasive plants in continental Mediterranean France.. Listed as a major invader in Mediterranean France, defined as being widespread and having a significant ecological impact. 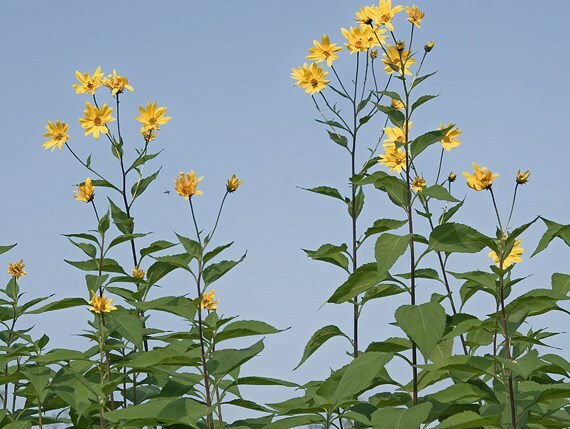 Several other species of Helianthus are listed in Randall 2012 but most are only indicated as naturalized. Several species are listed on the DAISIE invasives website for Europe but without much information. Helianthus ciliaris is listed by Randall as invasive in several areas, including California, where it is an A-rated noxious weed due to impacts in agricultural fields. This is a widespread species that grows in much of North America and Europe, as well as scattered locations in other parts of the world. Listed as a major invader in Mediterranean France, defined as being widespread and having a significant ecological impact based on field observations. The reference did not give details (it's just a list of species) but I am making the assumption than if it's considered a major invader, it must be displacing native plants. Grown as a food crop and was eaten by Native Americans. The tubers are edible. Sold as sunchokes (this species is not actually related to artichokes, despite the name). Also eaten by snails in the Czech Republic. It was introduced into Europe partly as a food for pigs. Brenzel, K.. (2007). Sunset Western Garden Book. [Anonymous] (0). Flora of North America. (Barkworth, M.., Ed.). This is a sunflower that grows 10 ft tall. However, I don't have information on dense infestations or imprenetrable thickets. This does not seem likely given its biology. It's a large, fast-growing, perennial herb, i.e. a sunflower. I am guessing yes. In Britain, it flowers in October and seeds ripen in November. In its native range in North America, it flowers in August to October. The seeds are attractive to birds. Birds seem to be the main form of seed dispersal. As it's a native sunflower in North America, it could be included in wildflower packets but I do not have information on this and it has not really naturalized in California. In other places, it seems to have spread from plantings.